Stop! 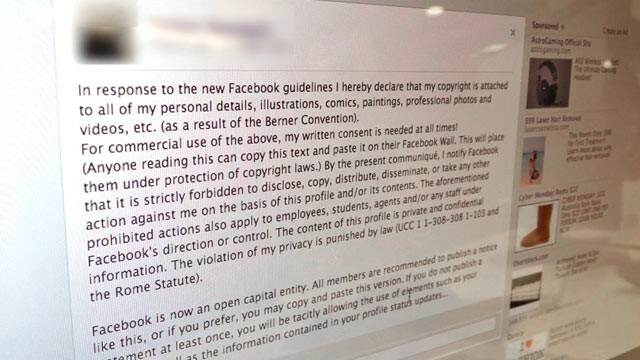 Don't Copy and Paste that 'Copyright' Facebook Message IS A HOAX!!! "In response to the new Facebook guidelines, I hereby declare that my copyright is attached to all of my personal details, illustrations, comics, paintings, professional photos and videos, etc. (as a result of the Berner Convention). For commercial use of the above my written consent is needed at all times!" You may have seen that very message pop up -- perhaps time and time again -- in your Facebook feed. The message has been making the rounds on the social network. It encourages people to copy and paste the text and post it on their own walls if they want to be placed "under protection of copyright laws." It's a frightful message and those worried that Facebook will own their photos or other media are posting it -- unaware that it is a hoax. Here's the truth: Facebook doesn't own your media and there is no such thing as the Berner Convention. "We have noticed some statements that suggest otherwise and we wanted to take a moment to remind you of the facts -- when you post things like photos to Facebook, we do not own them," Facebook spokesman Andrew Noyes said in a statement. "Under our terms (https://www.facebook.com/legal/terms), you grant Facebook permission to use, distribute, and share the things you post, subject to the terms and applicable privacy settings." Snopes.com, a site dedicated to clearing up fallacies on the Internet, reminds Facebook users of that same thing. "Facebook users cannot retroactively negate any of the privacy or copyright terms they agreed to when they signed up for their Facebook accounts nor can they unilaterally alter or contradict terms instituted by Facebook simply by posting a contrary legal notice on their Facebook walls." This isn't the first time a message like this has popped up on Facebook. A similar message made the rounds in June and a few years ago as well. Bottom line? Don't bother copying, pasting, and posting. It was a hoax before and is still a hoax now.